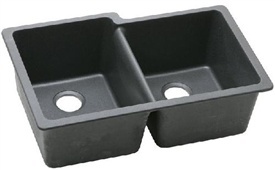 Sinks have to stand up to daily use, so they must be durable. At the same time, an attractive sink can become the focal point of an entire kitchen or bathroom. At Intermountain Stone, we specialize in products that feature the perfect blend of aesthetics and functionality. We guide Utah residents in sink selection, ensuring the final product you choose showcases your unique style while offering features that make your meal preparation smoother and your cleanup more enjoyable. There’s more to choosing a sink than simply deciding on the look. Depending on the material and the construction, kitchen sinks have the capability to resist scratches and stains, muffle sound, withstand extreme temperatures and last for decades. You have options when it comes to depth, size and shape. You can decide whether you’d like an overmount or undermount sink. A good place to start is with understanding the differences between composite and stainless steel sinks. Composite sinks may be made of granite, porcelain, fiberglass, fireclay or other materials. They are sturdily built, particularly the granite composite options. Because of the high density of the material, you don’t have to worry about scratching or chipping. In addition, you can place a hot pan in the sink without marring its surface. Sinks made of fireclay, a type of ceramic material, offer many similar benefits to granite composite, such as scratch, dent and crack resistance. It’s also extremely easy to clean and it’s resistant to hot and cold temperatures. Its attractive appearance makes it a beautiful choice for kitchens or bathrooms. Explore the many advantages of composite sinks by discussing your preferences with the team at Intermountain Stone. Stainless steel is durable – that’s a given. It’s also a popular choice for kitchen sinks because it’s sleek and matches high-end appliances, giving your kitchen a professional, uniform look. 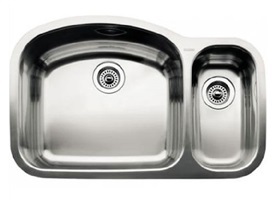 Stainless steel features benefits similar to composite sinks, including heat and stain resistance. When selecting a stainless steel product, it’s important to understand its specifications. For instance, stainless steel thickness is measured in gauges. The lower the gauge, the thicker and more durable the sink. Stainless steel sinks also can be ordered with sound muting-properties, such as a spray or padding that helps reduce the clatter of dishes and silverware. You also can choose what type of finish you’d like, such as shiny mirror or a brushed satin. From faucets to garbage disposals, there are many additional accessories to help complete your sink setup. Trust Intermountain Stone to outfit your kitchen or bathroom sink with the right strainer, filter or flange to complete the look. Contact us today to learn more about how we can help you create your dream kitchen or bathroom. Our wide selection of sinks and accessories offers the perfect way to customize your renovation or new build. Call Intermountain Stone, Utah’s premier provider of countertops, sinks and more, to learn more about how to get your dream kitchen today.